Are you into watching some good movies? How about the five Oscar Nominees for Best Picture? How about all five in one day? 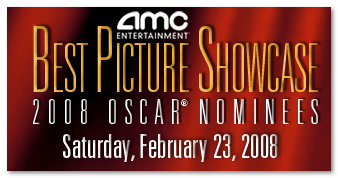 Yes, AMC Theaters are showing all five Oscar Nominees for Best Picture in one day at select theaters around the country (sorry US only) on Saturday Feb 23rd. Every year, AMC theaters run a special called AMC Best Picture Showcase where they show five films nominated for Best Picture in one day for $30. You get a free large popcorn and unlimited refills. Even if you aren’t a movie buff you could probably tell this is a great deal. You have to check to see if there is a theater near you that is participating in this special. How about 12 hours of movies? I have seen 3 movies back to back and I’m not sure if I’d do it again. But, there is a really good mix of movies here. Although, some movies are best enjoyed when you have time to replay the scenes in your head and enjoy the brilliance of the director, the screenplay or a funny moment. With this kind of schedule, I might come out at the end of the day with scenes from different movies mixed up in my head!! Would you be going to the AMC showcase? Before stepping into the blogging world, I loved watching movies more than anything else. In spite of that, somehow I never enjoyed watching OSCAR nominated movies. Really, I don’t know why I feel the same. Still, I will once again give it a try. Specially, “Atonement”. Hmm, $30 for five movies instead of just one like they do normally…now that IS a good deal. Rakshit, I just love watching movies. My tolerance level is pretty high for all kinds of movies except sci-fi. 😉 I love movies that make me think & laugh the best though. Atonement is pretty good adn I can’t wait to the rest. Mark.. it is definitely a great deal! Which one’s have you seen or planning to see? I haven’t seen any of them, K. Don’t think I will either. I love movies, but there’s not too many out there that make me want to go see them. Ooh.. little picky aren’t we? 😉 Just kidding man. I guess I put up with a lot of crap in some of these movies.